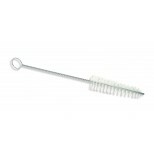 White nylon bristle tube or hole cleaning brushes. These brushes have a unique tapered trim for cleaning tapered holes. The synthetic white nylon is resistant to most solvents. Used for cleaning grime or loose debris from tubes or through holes.